On Monday, the NHLPA held their ninth annual Rookie Showcase by bringing NHL prospects and rookies to Mattamy Athletic Centre to have pictures and video taken for use by Upper Deck in upcoming trading card and memorabilia products, and their faces scanned for EA Sports’ NHL 18 video game. 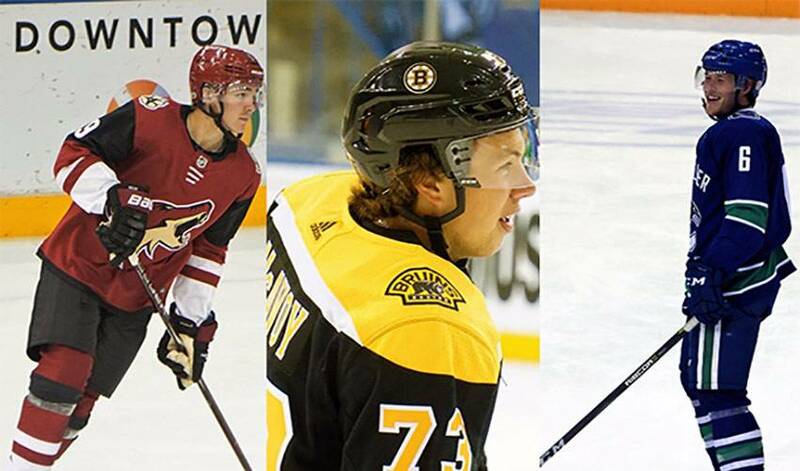 While the event was a day for some friendly competition both on and off the ice, these young players remain focused on taking the next step in their careers whether it be in the NHL, junior hockey or college. Out of the 26 rookies who attended to the event, six have made already made their NHL debuts, giving them a head start on their summer preparation. Forward Clayton Keller only had a three-game stint with the Arizona Coyotes near the end of the season but remains determined to contribute right out of the gate. "That's what I worked for all summer, I just have to go out there now and do what I do,” said Keller. “I don't want to just be there to be there, I want to have an impact right away. So that's one of my goals." While these players have only played a handful of games with their respective NHL clubs, the experience alone is something they will always remember. Charlie McAvoy made his debut for the Boston Bruins in the playoffs only a year after being selected 14th overall. “It was crazy, I remember it being a whirlwind. I called my parents and got them on speaker and explained to them what was going on. My mom was so excited she was kind of crying and my dad was so happy, he was through the roof,” said the 19-year-old about sharing the news of his debut with his family. Not only did the young defenceman get inserted into a postseason lineup, he became only the third rookie to play 24 minutes or more in his playoff debut. The difference was that the two other players were much older – Paul Martin was 23 when he made his debut and Johnny Boychuk was 26. McAvoy would go on to play six playoff games for the Bruins, scoring three assists and averaging 26:12 of ice time. So how was he able to flourish in a high-pressured situation? McAvoy credits the coaching staff for allowing him to play his game and a strong leadership group that includes captain Zdeno Chara. Other rookies said they were grateful to have the same type of support, because it assured them that they were doing everything necessary to be ready for training camp. Vancouver Canucks forward Brock Boeser said he was fortunate to have former University of North Dakota teammate, Troy Stecher, to go to for advice. While these players were happy to dip their toes into NHL waters to get a taste of the game at its highest level, they are ready to dive in and compete for a full-time role even with no guarantees of a spot in the lineup. McAvoy knows that if you want to have success going forward, it is not about what you did in the past but what you do going forward.